Spray after sun Mustela is ideal for skin care after sun exposure, from birth. 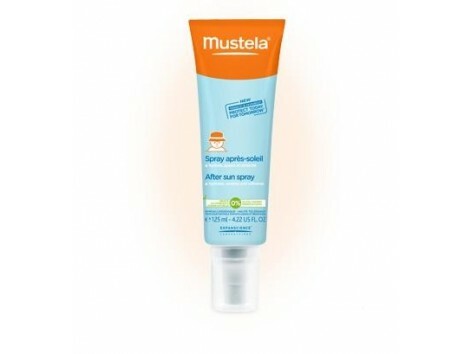 Mustela offers Spray after sun, is ideal for skin care after sun exposure, and can be applied des birth. The post-sun spray soothes, refreshes and moisturizes the skin attacked by the sun thanks to its ingredients immediately, leaving skin soft and supple skin. The Avocado perséose cell preserves capital and prevents cell damage. Jojoba oil nourishes, soothes and regenerates. Cupuaçu butter moisturizes and protects. Soothes, refreshes and moisturizes the skin attacked by the sun, thanks to jojoba oil and cupuaçu butter immediately. Leaves skin soft and supple skin. No parabens, no alcohol, ensures high tolerance from birth. Using the after sun Mustela spray? Apply preferably after shower or bath on face and body performing a gentle massage to facilitate penetration. The spray can be used in all positions, even upside down. Its light and fluid texture allows easy application and leaves no sticky skin. Ingredients: Aqua (Water), trilaureth-4 Phosphate, Butylene Glycol, Dicaprylyl Carbonate, Paraffinum Liquidum / Mineral Oil / Huile minérale, Pentaerythrityl Tetraethylhexanoate, 1,2-Hexanediol, Simmondsia Chinensis (Jojoba) Seed Oil, Theobroma grandiflorum Seed Butter, Parfum (Fragrance), Glyceryl Caprylate, Carbomer, Tetrasodium Glutamate Diacetate, Xanthan Gum, Sodium Hydroxide, Citric Acid, Persea Gratissima (Avocado) Fruit Extract.